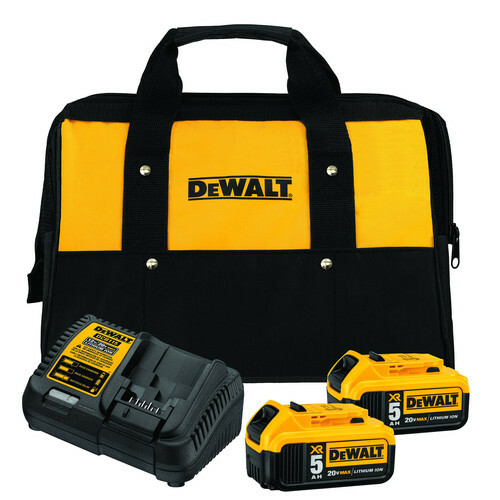 *Add two qualifying DeWALT bare tools to your cart and the free item will automatically be added. Limit 2 free items per customer. Offer valid until 11:59pm ET on April 30, 2019 or while supplies last. No adjustments to previous purchases. Subject to change without notice. The DCS380B 20V MAX Reciprocating Saw has a variable speed trigger delivering up to 3000 strokes per minute allowing you to match speed with application and a 1-1/8" stroke length for fast cutting. The keyless lever-action 4-position blade clamp makes changing blades quick and easy and allows for a variety of applications including flush cutting. The pivoting shoe provides leverage during cutting and extends blade life. Battery and charger sold separately. The second Dewalt 20 volt tool I purchased over 4 years ago. It's been fed many a hot super. Primarily deck boards and oak tree limbs. Not really a lack of power from cordless. The reason why I chose to stick with Dewalt after this tool was because FedEx left it in the driveway and it was ran over before I even got to touch it. Packaging was tore off and I've never had a problem with it. Shell was intact and it's worked absolutely fine. Like Dewalt says "guaranteed tough"
This saw is an excellent complement to my drill/impact driver set (I am slowly converting from the old 18V XRP to 20V). This is the best reciprocating saw I've ever owned - plenty of power and user friendly. I recommend using a minimum of 3.0 ah batteries. Bought this saw while on sale (tool only and I have used it multiple times. It is incredibly powerful and the batteries last a surprisingly long time. I used it to demolish and old deck and chicken coup and it made quick work of cutting through the planks and 4x4s. its one of the best made I buy all my tools from you!! I regretted not buying this saw DCS380B since it came out, if you own a home this saw is a must, it is very versatile saw, pruning palms, limbing and cutting trees and doing house repairs that required cutting or plunging cut. It is an all around saw! Cordless is the only way to go when pruning palm trees. Excellent saw! Had it only one day its great. I buy nothing now but Dewalt. This is the best sawza I have ever owned way better than Milwaukee by far. I'm an Electrican and do wiring on new home and use all Dewalt tools. They are so dependable i use them everyday. I have nothing bad to say about my dewalt tools they are very dependable.i use Drills amd saws of all kinds but the are all dewalts and the new 20 volt was a life saver they last really good and have the power to get the job done.i would put them up for any job hot weather or cold they seem to be good. Is the 20V battery interchangable with the 20V battery for the 20V Max Lithium Ion Compact Drill Driver? BEST ANSWER: Yes, all 20v batteries and tools are interchangeable with each other. Yes it is. Its very convenient. will the dcb207 work with saw? Yes,the dcb207 is compatible with this saw. BEST ANSWER: It certainly does cut branches. Works best on the smaller branches and does use up a lot of battery power. Be prepared with extra batteries. Yes, this is a good item for cutting reasonable sized branches. What is the part number for the battery needed for this saw? BEST ANSWER: Dewalt recommends the DCB200,DCB205, or the DCB205. It is part number DCB200. can a DBC207 battery be used in a tool with a DCB204 battery? Hi. Can I use my DCB203 battery with that tool? BEST ANSWER: Yes,the 380b is interchangeable with the DCB203.